COMMENT: Dear Mr. Armstrong, I look to help others as you do. My wife turned 60 in June and we planned a trip to Milan and Lake Como on June 30. We arrived at the airport in Nashville yesterday, checked in, printed our boarding passes and tagged our luggage, then presented our tagged luggage to the AA attendant. She reviewed our passports to verify the name matched the luggage tags and boarding pass, then said we could NOT board the plane. We were told that my passport expires less than 60 days before our return flight and we would not be allowed to board without an updated passport. I spoke to the gate manager at AA and he indicated we would be deported if we arrived and checked in to Italian customs. My passport does not expire until a month after our return, but we were told it has to be 6 months. When we purchased the Airline tickets, we entered the passport information to include the exp date. No problem was indicated. We checked in the Airport with our Passports and entered the exp date. No problems. We had to process all the way to the gate to be told we could not travel. How does this happen with the advanced computer systems we have today? How costly could it be to update the program for buying tickets to reject a passport number with an exp date of 6 months or less? AA told us it was not their fault, but they stand to gain significantly with change fees. I have been traveling internationally since 1981 and have never encountered this problem. I have not spoken to a person who travels internationally that knew about this rule. REPLY: Each country has different rules. The 6 month rule is also applied by the USA to foreigners and that also applies to visas. Any employee from Ukraine has to have a visa that will not expire in less than 6 months in order to come here even if their passport is good for 10 years. I have a very good travel agent who books me on international flights in the most amazing ways. Often they will be one-way tickets because meetings pop-up often during a crisis and so it is not always black and white when I have to travel overseas. Some just learned through the grape-vine that I am in their country and requests begin. Most of the time I have no problem even with one way tickets. The only country that causes a problem is France. I must have a return ticket out of France. One from Greece does not count for some strange reason. My agent will book a first class return fully refundable for me to land booking that the day before. When I arrive, he cancels it and I can then go on my way around Europe. The easier work-around is to travel to France within the EU and fly into Frankfurt or Brussels first. It is the airline fault for their computers should flag a passport that expires in less than 6 months. There are many countries that do have that rule, yet it varies. 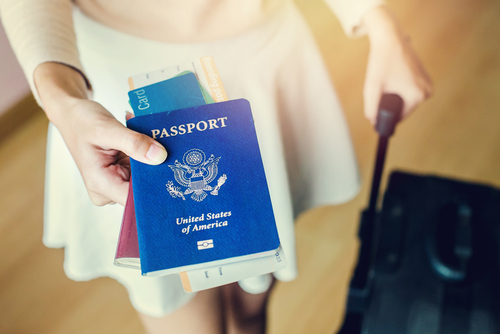 Best to renew a passport more than 6 months before it does expires just to be safe.